Blueberries, orange and banana. The simple thought of that combination instantly makes you feel better. Blueberries to bury any blues, a citrus slap in the face and bananarama goodness to smooth it all out. Occasionally a bottle of juice makes it into our household (ahem, partner) and when it does, I’m still going to enjoy it 🙂 Here’s how I decided to use the orange juice currently residing in our fridge. This makes about 350 ml and provides approximately 480 kJ, 1.7 grams protein, 0.3 grams fat (0 grams sat fat) and 24.8 grams CHO (23.1 grams sugar). That’s a fab idea – a scrumptious breakfast version! 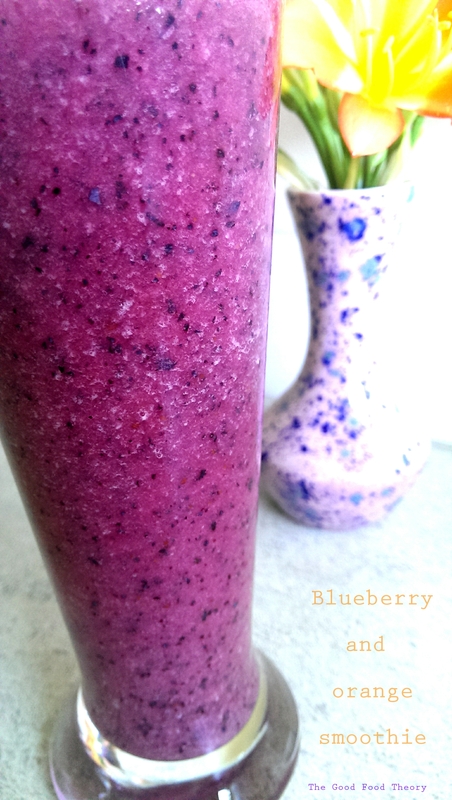 The smoothie sounds so delicious and refreshing! Thanks Ada 🙂 I finally got to make your avocado and banana bread! It was absolutely divine and worth the anticipation. The avocado gave it that soft, ‘buttery’ texture and the honey was deliciously fragrant.